Hero moto corp is planning to launch its new bikes and scooters in the 2019 year. As we know Hero is the leading brand in motorcycle manufacturing in India with Hero Splendor as its Ace of Spade. A company is planning to launch new models in 2019 along with improved versions of current models. This 2019 year company may be launch 5 models of which three are motorcycles and two are scooters, we are listing all five with their technical specifications. 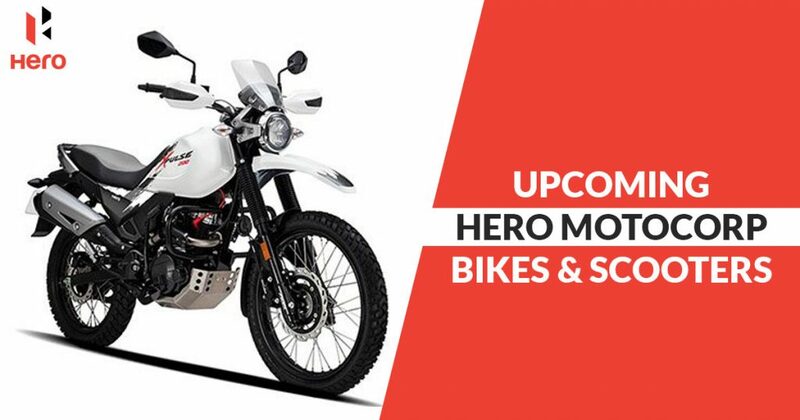 Hero Dawn 125 is a commuter bike from Hero MotoCorp that is speculated to launch in India in the coming future as commuter bikes are high in demand in our two-wheelers market. In terms of body language well the motorcycle obtains some stylish elements though it means for strength, durability and fuel efficiency. It is one of the reasons the Dawn 125 is available in African countries due to the terrain there and high demand of such bikes. Powered by a 125cc, single-cylinder, liquid-cooled engine the Dawn uses the churning power of 9bhp at 7000 rpm and 10.35Nm of peak torque at 4000 rpm. The engine comes mated to a four-speed gearbox and rated to deliver fuel efficiency around 60-70 kmpl in real life scenarios. Hero Xpulse 200 is an adventure motorcycle that’s highly anticipated among Indian biking enthusiasts. It is likely to launch in the country around March 2019. At the powertrain, the motorcycle will get the same 200cc air-cooled single-cylinder engine doing propelling duties on the Xtreme 200R. The engine is said to return the power output of 18.4bhp and the peak torque of 17.1NM via a mated five-speed gearbox. However, we could see sorts of adjustments at gearing keeping bikes segment into mind. The fuel efficiency from the engine is the question is expected around 32 kmpl. Among underpinnings, the Xpluse gets 190mm of travel at the front forks and 170mm of travel on the 10-step adjustable monoshock at the rear. While the disc brake units at both wheels will perform braking duties. Hero Maestro Edge 125 is among lined up upcoming from India’s largest motorcycle manufacturer. It is likely to hit the country anytime soon this year. The Maestro Edge 125 will be a sportier scooter which will cater to the youth of our country. As like the lately introduced sibling, the Hero Destini 125, the Maestro Edge 125 is also expected to be priced handy around INR 59,000 (ex-showroom prices). Powering the scooter will be a 124.6cc air-cooled engine of the Hero Destini 125. The engine is said to make out 8.7bhp and 10.2Nm of peak torque. However, we can see sorts of a bump in power and torque by around 10 percent as it will be a sportier scooter. Hero HX 250R is a sports bike with a sporty look and stunning graphics. It comes with a single cylinder, liquid cooled, DOHC engine which comes with a 6-speed gearbox. If we talk about engine efficiency than it produces 31 BHP power and torque of 26 Nm. It comes with front disc and rear drum brakes, the company claimed figures for speed, it can reach 60 KMPH of speed from 0 in 2.7 sec. Price is not disclosed by the company yet but it is expected that it would cost around 1,50,000 to 2,00,000 INR. Hero is likely to introduce new scooter called Dash till the end of this year. Hero Dash is enabled with four-stroke, 111CC, single-cylinder, Forced air cooled cylinder that produces 8.45 BHP of power at 7500 RPM and maximum torque of 0.95 Kg at 5750 RPM. It comes with front disc and rear drum brakes, which gives it efficient braking and control. Hero Dash is the first Hybrid scooter from the company. Leap uses serial Hybrid concept, as it runs on Lithium-ion batteries that will give power up to 8 KW, producing 10.5 BHP power. It can run also on 124 CC petrol engine. The best part of this scooter is that when the battery got exhausted, the generator attached to the petrol engine will charge the scooter. Hero MotoCorp is also planning to unveil a tourer model in the upcoming months for long riders, called Hero ZIR. The model has been showcased in Jaipur Auto Expo, 2015. This model receives the full fairing, bulky design, twin headlights, wide air shield, and much more advanced features. The engine displacement is 157cc along with INR 85,000 (estimated price).